The ECI – the European Color Initiative is a group of experts who deals with the media-neutral processing of color data in digital publication systems. It was founded at the initiative of the publishing houses Bauer, Burda, Gruner + Jahr and Springer in June 1996 in Hamburg. The ECI is for the preparation and publication of color profiles currently the organ in Europe. New standards such as Fogra 51 and 52 are supported in the initial phase of the Fogra, and then handed over to the development and publication of the ECI. 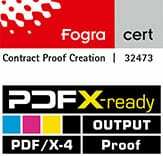 All currently valid color profiles for proofing and printing are provided on the website of ECI for download.